Ecuador boasts one of the most varied, stunning landscapes in the world. From rainforest to mountain ranges to quaint and colonial cities, the country has something to offer to every style of traveler. Craft Travel’s “Ecuador Eco Deluxe” is just that - a comprehensive package that combines urban sass with pristine nature, all while staying at some of the top eco-friendly lodging on the planet. Top it off with a full immersive experience of the world-famous Galapagos Islands at this price point, what more can you really ask for? DAY 01 | WELCOME TO QUITO! Welcome to Ecuador! Upon arrival to Quito’s International Airport you will be transferred to Hilton Colon, ideally located in the center of Quito’s bustling business district and just 10 minutes from the historic center. You will have the evening at leisure to explore the surrounding neighborhood or simply relax for a busy week ahead! After breakfast and check out, you will be transferred out to Mashpi Lodge, a journey of approximately 3 hours to the western slope of the occidental flank of the Andes. The rapid change in altitude allows you to discover the wonders of the Andean landscape. The road crosses the valley of Pomasqui dominated by Andean dry forest, and then to the western flank of the Andes through the Cloud Forest and the road ends in Mashpi at the beginning of the tropical rainforest. Upon arrival you will be greeted by staff for a 30-minute introductory talk about the Cloud Forest and its conservation, the activities during your stay and some helpful tips about what to wear and what to bring to the excursions. Now it’s time to enjoy a delicious lunch on site before your first excursion, a two hour trek along the Napa Trail taking you through patches of pristine forest and areas of regeneration. This evening, enjoy dinner and a special lecture on property about the Cloud Forest, secret wildlife and special research projects. Rest up for an early morning and full day tomorrow! Today you'll have an early start to witness morning birding inside the forest en route to the Sky Bike, a novel and exciting way of exploring the forest canopy up close. Designed for two people to use at once, one person pedals the bike along a cable stretched between two points in the forest – around 200 meters (655 feet) apart – while zipping over a beautiful gorge complete with running rivers that flow around the rocks and trees below. It is truly a unique and unforgettable experience. Next. 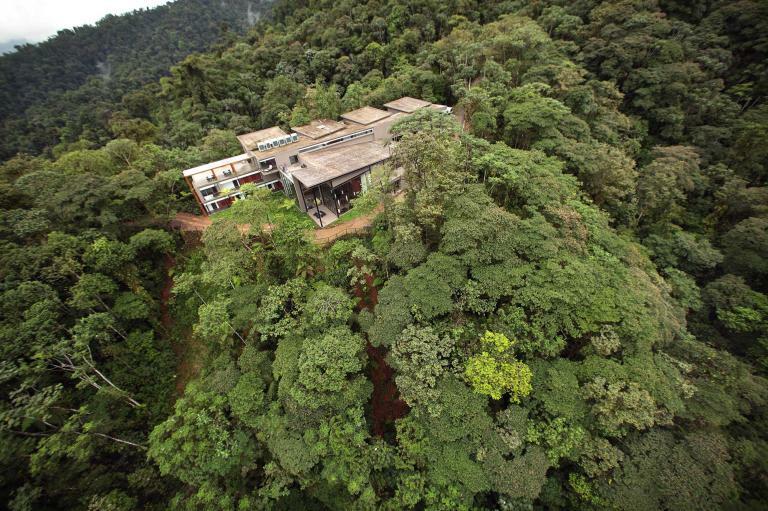 climb the eight storied Observation Tower, ideal for all types of wildlife lovers. Species spotted from here include toucans, woodpeckers, barbets, tanagers and parrots, as well as birds of prey. After lunch, meet your local naturalist for a walk along the Howler Monkey Trail. Your guide will point out different species of colorful birds and, of course, the very vocal howler monkeys. Arrive to the Life Center to enjoy the view of the surrounding flora and fauna. This area is dedicated to growing useful plants and beyond, many varieties of bushes and fruit trees, including banana and plantain, manioc, cacao, hot chili pepper, coffee and wild raspberries. Head out for an evening hike to witness the transformation of the forest at night, noticing the intensified sounds and smells as your senses are awakened. This overwhelming experience known as a “night safari” is where, unlike others, guests find the beauty in the small details, like the croaking of frogs or the hum of insects. Dinner will be served back at the lodge, where you are free to relax before bed. Have an early breakfast this morning to enjoy one more excursion in the Cloud Forest before departure! Your naturalist guide will be waiting to take you on a magical medium-difficulty walk through primary forest, where many of the centenarian trees of the Reserve managed to survive the logging period. The copal tree (Dacryodes cupularis) is perhaps the most emblematic of these trees, and its resin is actually used by local communities as a natural anaesthetic as well as an incense. The trail leads to a waterfall, where an enchanting curtain of mist billows out from its base. Bring a swimsuit in case there is time to jump in! You will be back to the hotel by noon to refresh up and check out. Lunch will be waiting for you at the restaurant, after which you will head back to Quito at 1:30pm. Upon arrival to Quito, check in to your familiar hotel and take the night as you wish. Tomorrow will be another full and exciting day! After breakfast and check out this morning, you will be transferred to the Airport for your flight to the Galapagos Islands. Upon arrival, a representative will meet and take you to the Royal Palm All Inclusive Hotel Galapagos, where you will have lunch and choose from a menu of exciting afternoon activities! This evening, enjoy dinner at your leisure, exploring the property or perhaps turning in early for the night. Enjoy a delightful breakfast before your Yacht Expedition! This fantastic daylong tour offers spectacular volcanic landscapes and great snorkeling. The journey in the launch takes almost two hours but there is the chance of seeing dolphins and even whales during the crossing. Stop at Daphne Island, a volcanic tuff cone formation to view the sea lions and various sea birds that inhabit it. Bartolome Island itself is famous for its ‘Pinnacle Rock’ - probably the most photographed volcanic formation in the islands. Climb up a long wooden staircase comprising of 360+ steps to the viewpoint on the summit that offers uninterrupted views to nearly all the central islands in the archipelago. 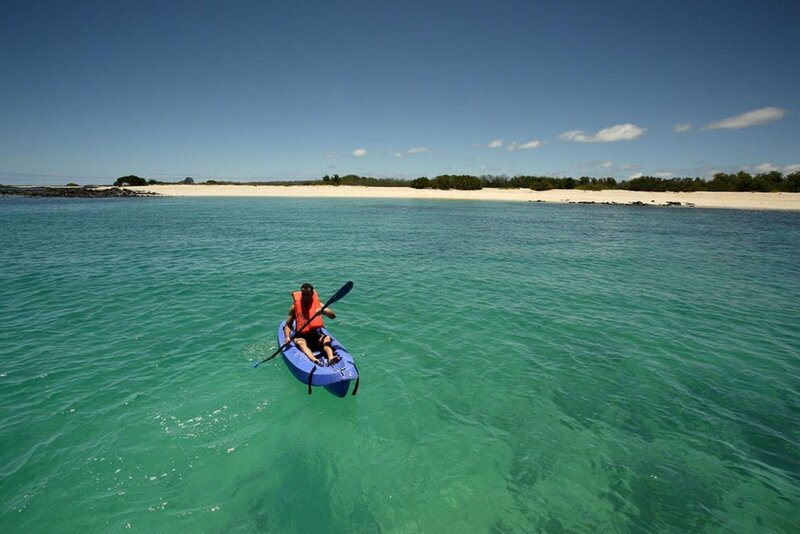 A short dinghy ride after the walk will allow you to photograph the Galapagos Penguins that live along the coastline. Lunch is served with one of the most amazing volcanic backdrops found anywhere in the archipelago. Please bring walking shoes, sun hat, sun block and beachwear. *Weather dependent, location could vary between Bartolome Islands, Seymour, South Plaza or Santa Fe. Return to the lodge for dinner and a night at leisure. Wake up and have your breakfast at leisure. Today’s activities choices are completely up to you, with the option to choose from the menu below. Do as little or as much as you’d like on your final full day in Ecuador! After breakfast and check out, you will be transferred out to the airport for your flight back to the mainland and home.